Sally hops in the car and throws her backpack on the seat as you slowly drive out of the school car rider line. “How was your day?” you ask her with a glance through the rear view mirror. “Good” she replies, followed by seconds of silence as you drive home. Ben walks in the door, drop his backpack and kicks off his shoes. He instantly heads for the pantry looking for a snack to satisfy his school-day hunger. “Don’t forget to wash your hands first” you say. He grunts and begrudgingly rinses washes his hands. “How was your day?” you ask with curiosity and kindness (trying to make up for the heavy burden of asking him to wash his hands). “Fine, I guess” is all you get before he escapes to his bedroom. Lucy comes in with a whirlwind of chatter. “Mom, you’ll never guess what happened today!” You listen to her 5 minute (slightly exaggerated) story about her friends doing silly things, a weird comment made by a classmate, or ridiculously difficult homework assignment. You love your little (or big) kid and, because your child has been apart from you all day long, you want to hear all about their day! If you’re struggling to connect with your child after school, here are a few expert tips for getting the conversation going. Tip #1: Ask specific questions. “How was your day?” is such an open-ended question. It causes your child to think about every part of their day and pick the important things to share. For kids with people-pleasing tendencies, they must select the thing that Mom would most like to hear about. For kids who don’t love school, there is an unspoken pressure to make the day sound better than it was. For kids who think school is the best thing since sliced bread, they can’t possibly sum up their day in one answer. To all kids…that’s overwhelming! How was [special area like art, music, PE, etc.] today? Did you learn anything interesting in [history, science, math, english] today? Did you see [friend] today? If you could only tell me one thing about your day, what would you tell me? Tip #2: Follow up on previous discussions. What did your child tell you about yesterday or last week? Try to remember what stands out to your kid, what they are looking forward to, or what they are dreading. If it helps, keep a little notebook or digital note of conversation details. How did your test in [class] go today? Are you looking forward to your [field trip, movie, special activity] tomorrow? How’s your project in [class] coming along? Are you still learning about [topic]? Did you get to see [friend] today at [lunch, recess, pep rally]? You have [a day off of school, a half day, a holiday] on [day]. What would you like to do with the extra time? Tip #3: Have a question of the day. Let your creative and imaginative juices flow! 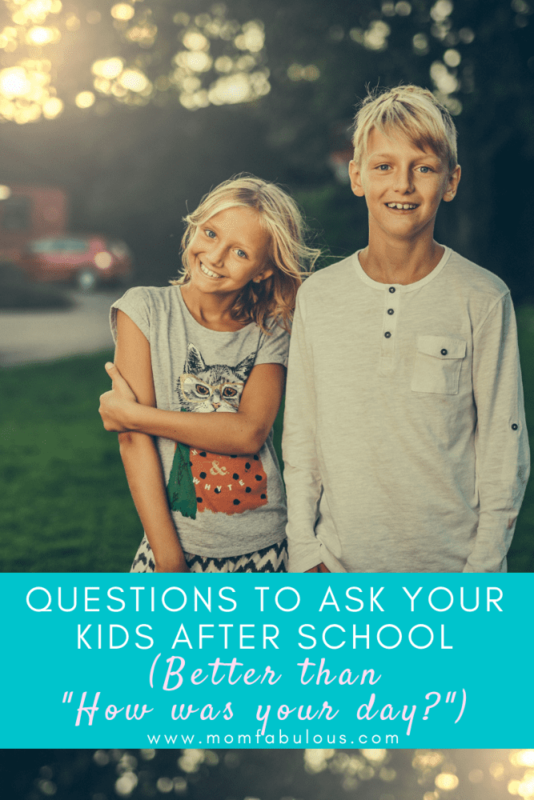 Ask your child a special question everyday after school. If you need some inspiration, grab a family conversation kit or browse here for topic ideas. If you could be any animal, which kind would you be and why? You have one super power – what is it? Tell me about your favorite breakfast/lunch/dinner/snack/dessert. What would be a good new invention? If you had to be a teacher, what subject would you teach? Want to have more family discussions? Play the high-low game at dinner! Each person gets a turn to share the highest (best) part of their day and the lowest (worst) part of their day. This is a fantastic way to hear what’s on your child’s heart; plus, everyone gets a chance to be in the hot seat so each family member gets a little bit of undivided attention. It’s never too late to initiate intentional conversations with your kids, no matter how young or old they are! Try asking more specific questions about their activities, interests, emotions or friends. Gradually your child will begin to look forward to your creative questions, get excited to talk with you, and begin to trust you more. Modifying your “How was your day?” question will morph into a trustworthy parent-child relationship built on communication!